Designed by Jared Wolfe and Tom Lam this smartphone-controlled biopod allows you to have anything from an herb garden to a micro rainforest. Having had great success at Kickstarter (still accepting pledges) the team claims their invention controls temperature, humidity, light, ventilation, and even rainfall. This low-maintenence terrarium also allows for replicating ideal animal habitat conditions, which is perfect for animal enthusiasts and classrooms where kids can learn about different animals’ habitats in front of their own eyes. Biopod was also conceived as home and office decoration that does not only provide function but also de-stresses the environment. It’s also interesting how the app works. It tells the seed variety growth length and record growth in time lapse mode. You can tell it what you grow and it gives you the estimates of blooming time and the time for harvest. 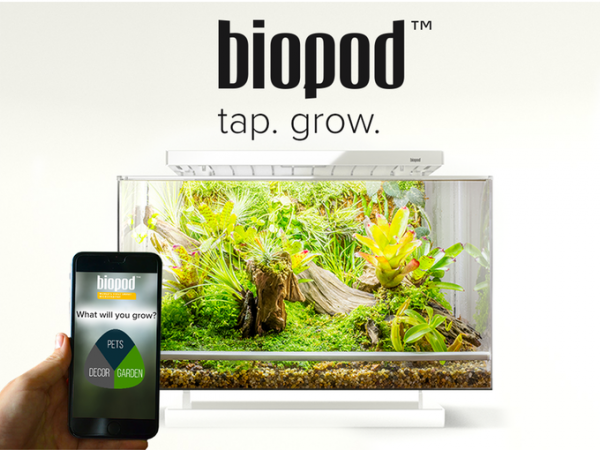 The Biopod Kickstarter campaign has 20 days to go and includes pledges from $5 to $1400 with $199 to $289 already sold out.